Granted, Jakob Dylan has always imparted a little bit of himself through his songs. However, there's something about the quiet nature of many of the tracks on The Wallflowers' third release Breach that makes the album sound a whole lot more introspective than anything else the band has done. This, of course, can be a double-edged sword as the heavier emphasis on lyrics can only serve to draw comparisons to father Bob's compositions. However, setting that aside, the young Dylan has turned in quite an outing, one that successfully plumbs the depths of his relationship with the music business, which he intertwines with reflections on his father, to express his innermost thoughts, feelings, and insecurities. The opening track Letters from the Wasteland defines Dylan's growing disconnection from his fans, while Hand Me Down refers directly to the criticisms he's received as an artist. Throughout Breach, The Wallflowers effectively incorporates itself into the regal lineage of classic rock artists that includes Tom Petty, Bruce Springsteen, Neil Young, Jackson Browne, The Eagles, and Elvis Costello, who incidentally also appears on the disc. Much like Wilco, however, The Wallflowers also dresses its album in more contemporary styles, fusing its influences with modern fashions, such as the infectious, Fastball-fueled power pop of I've Been Delivered. 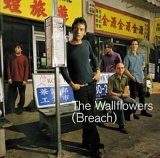 The result is that Breach is unquestionably The Wallflowers' best album to date, and it is nearly a masterpiece. The hit-single Sleepwalker rumbles with anger as it yearns for acceptance, while referring to Sam Cooke's Cupid in the process. Likewise, Murder 101 bursts out of the latter part of the outing with a punk/new wave ferocity. Interestingly, however, the band also delivers a number of sparse, intimate selections including the reflective Witness and folksy spiritual Mourning Train. On the former, the group employs a horn section and a chorus of voices to build the song into a majestic anthem, while the latter chugs along in aching desperation. Capping off the collection is a bonus track titled Baby Bird — a lullaby that begins with a music box-style keyboard arrangement, which proceeds to flutter and surround Dylan as if to boost his confidence and lift his spirit. It is on these songs that the collective shows intriguing new direction and personal growth, and though it's been four years since The Wallflowers last effort, Breach was well worth the wait. Breach is also available from Barnes & Noble.